Round 10 of our race groups monthly meetings was run on Saturday night. For the second time we raced at Joe's track while we wait for Bo's track to be completed. No one complained and the extra attendance makes us think that Joe's indoor track is the place to be on a winters night. 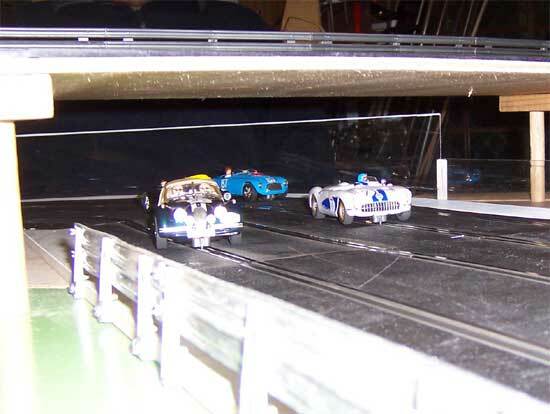 First round for the night consisted of our NC1 classic series consisting of the usual Ninco classic cars as well as Charlie and Dave's Carrera Aston MartinDB3's and my Airfix kit E type Jag. 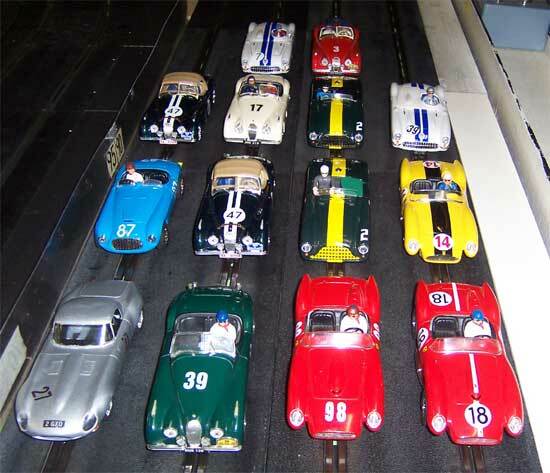 It is good to see the old guard is being broken up now with a few different cars being raced from the usual front running Ninco XK120 Jags and Ferrari 250 TR's although they still finish high up the field. First heat first lap and first time into the R1 radius esses Al is punted over. 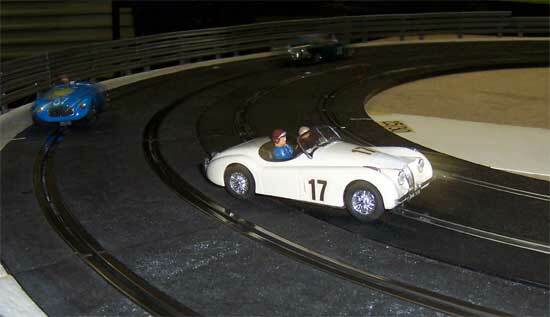 Charlie sneaks though with the Carrera Aston one side and Cameron the other with the XK 120. Poor courteous Glenn patiently sits behind not wanting to push through. He did narrowly scrape through for the heat win though. Greg holding a nice drift through the turn with Glenn's Blurred Ferrari 166 coming close behind and Alan is coming into veiw. Yes that is another Al. Not many names to chose from out here in Western Sydney. 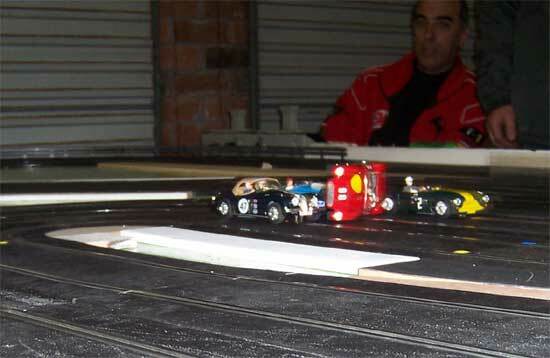 Chris gets a good start but Dave's Carrera Aston which is hidden eventually came through for ther heat win. Glenn's Ferrari placed second this heat with Viv in Dave's rent a drive Vette doing well also. Then came Glenn, Charlie, Graeme, Alan, Greg, Cameron and Chris. Open Sports ran last on night and as can be seen here there is no favouritism between Old style and new. This is Cameron with the fishtailing Slotit Porsche with Paul up the inside in the Ninco Honda. Chris in the Porsche leading dave with the Ninco Supra. Graeme must drive a kart better than this as he still lives to talk about it. Don't get in Chris's way on the first lap. Results were and absolute slaughter to Joe as most of us failed to get to grips with the lesser traction with our overpowered cars. Then Viv, Chris, Charlie, Greg, Alan,Cameron and Graeme. Glenn retired early for the night with a virus. In between we ran the host V8 class but I didn't take pictures as they are the same cars as we always run. All cars are set up by Joe and run on the same lane all night with the drivers rotating. then came Chris, Al, Bo, Viv, Cameron, Graeme, Alan and Cameron. Looks like you guys are doing similar to us. Our Classic serie shas proved so popular that we have extended the series two weeks. We have allowed different motors down here though . 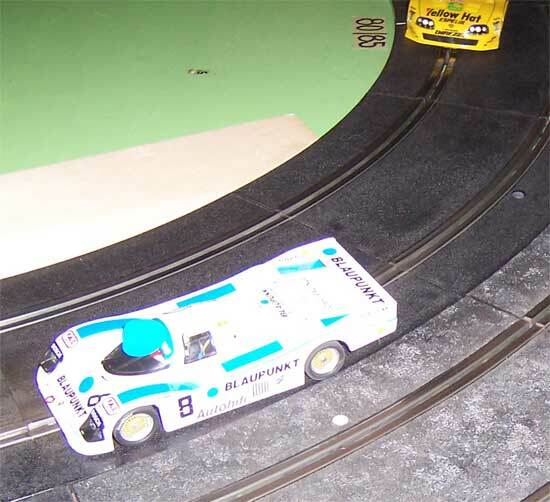 The same fun level applies to the Ninco Porsche 934 series, which we alternate with Ninco Classics, and the Scalex V8 series. 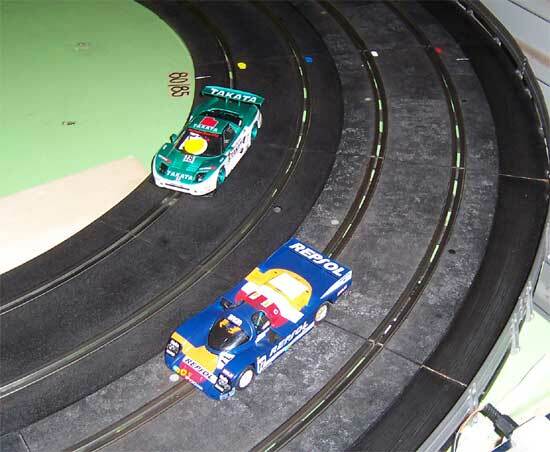 The enjoyment and intensity seem a little higher when these very simple cars are very evenly matched. Anyone is able to come along, see anyone else's setup, and go racing and testing. Cameron's repainted Skaife car has a few of us ordering decals from Patto to widen the field. It looks like V8's will be one of the 2006 series races we run (here's hoping). I will miss racing the Porsche 934's next time as I decided to race the 12 hour mountain bike race the same day/night. I think I had won every round with my Jagermeister version so I am sure you guys wont miss my car that much. A tip Glenn. Put on some new shocks if any look a bit sticky. I did and it showed with the lap times and ease of driving. On the classics I was having trouble deciding whether to race the E Type or the Carrera 300 SLR s that also goes quite well but having not run the Jag for so long meant it was the one to run. I have to agree with Bump the Ninco classics are a real buzz to both watch and race in. The racing is usually close and recently we are starting to see cars other than the Jags which makes the field look even better. Now big Dave also has an Aston Martin we should run a teams event we can start to mussle the rest of the field. Actually talking of teams event perhaps we could run something along the lines of teams race where say the first placed driver from the last meet teams up with the last placed driver, second place teams up with second last finisher and we combine their respective times to get a teams winner. I guess we could run it in any class but the classics would be ideal. Teams event? YES. We could use the host V8's just to keep it all even (replace those worn guides though). Yes the V8's would be perfect. 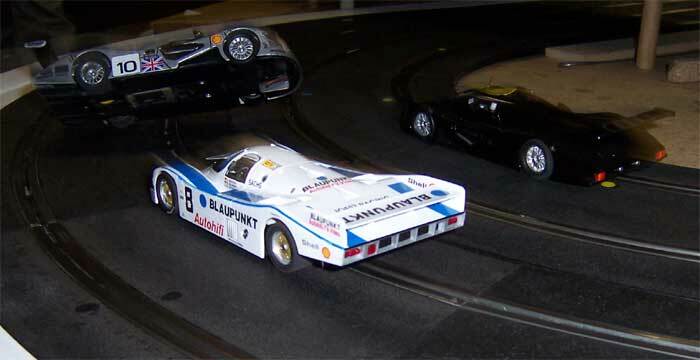 Cars are even and by teaming up drivers with different skill levels it should make a very close result. We could use the results from the last V8 host race as the method to select the teams. IF someone who was at the last host race cannot make it we just go down one on the list.  If someone turns up who was not at the last host race we could grade them on a previous V8 host race. I guess the only thing we would need to no in advance is determine who was going to be attending so the reams can be selected. Sounds great how do we make it happen??? Great write up Vince and some classic commentary too ! Do you guys run your classic class non mag ? We find that the Sakasu F 200 is a great replacement for the NC1 and about a third the cost and justa bit more grunt! We run on routed track with lead. this series we have allowed any motor but the Sakatsu and Scalex equivelent have made some great smooth cars to drive the more powerful car are O/K for the better drivers but the f200 cars are just as fast and a lot easier to drive. I don't know why we need to change things. When Joe won everything it was OK and I only won one event. Let me have my piece of glory you bastards as slotcars seems the only thing I can win at. This is a sneaky strategy by Joe to win the V8 class as well. Joe and Graeme together would not be fair. Devious do I have your support? I'm on your side Vinno, maybe you and I could team in the V8's. Or maybe a random draw. Heck, I'm just happy to be here. Devious. If you pair up guys in the sharp end of the field, they'll be under pressure to perform (expected to do well) while the rest of the field mulls about having no chance against the top teams. On the other hand, pair a podium guy with an up and coming racer will put heaps of pressure on the less experienced team mate and possibly frustrate the more experienced guy. Let's go digital and put all the cars on the track for a self marshalling enduro. I bags the Bargwanna car. Got one!!! Reel 'em in!! They're biting well today! Go Glenn!! Just pulling some chains, Devious. I'll do a Captain Kirk and reprogram the results spreadsheet. If (driver="bump", add 1 to lapcount). The new results spreadsheet is almost done and its better at swapping drivers around than yesterday's version. The only thing to be done is to have the driver list based on the results of the previous race, because Excel has lousy array sorting functions (i.e. none). If it gets too awkward, which looks likely at the moment, I'll keep this one as it is and we can test it at the next round.